How many times have you returned home from a beach fishing session empty handed due to the target species being out of range of your cast. Perhaps the swell was too big, or, if a kite fisherman, the wind drops out or changes direction? In recent times there have been a number of electric kontikis designed to overcome all of the above. Electrically driven kontikis powered by trolling motors can ignore wind speed and direction, and most use a timer mechanism to fish a specific distance offshore. The one failing of some is the inability to combat big surf, such as the waves often experienced on the likes of our west coast beaches, but Graeme Trim's Fishing Torpedo has been designed to handle such conditions, and is proven in surf up to three metres. At the heart of the Fishing Torpedo is a 16 amp, 12-volt trolling motor, which spins the stainless steel prop shaft at 1040 rpm. This, along with the design, gives the Torpedo plenty of grunt. The unit has a gross weight (batteries installed) of 15 kg. Two 12 volt, 12 amp batteries drive the three-bladed, eight inch prop, to give the Torpedo a range of up to five kilometres. Designer and manufacturer Graeme Trim of New Lynn has run extensive tests on the unit, and says the Torpedo will do 10 sets of 500 metres without a need to recharge the batteries, for about an hour's running in total. A timer located in the body of the unit determines the distance the Torpedo is fished. With the batteries connected and the timer set, the operator screws the rear, sealed, end cap up tight, and with a flick of the waterproof switch, the baits are on their way. The Fishing Torpedo will tow 25 baits out at 80 metres a minutes (5 kilometers per hour), fast enough to avoid the crabs that plague the baits of kite and more conventional kontikis. Graeme sells just the torpedo. The beach reel and 25 hook longline section we used was supplied by well known kite fishing manufacturer Paul's Fishing Kites. Graeme has made up his own beach cart and trace holder/baitboard to make transporting and using the Fishing Torpedo a simple affair. We tested the Fishing Torpedo off Waipu Cove in 'less than ideal' conditions. The weather man had predicted northerly winds of up to 130 kilometers per hour which, had they eventuated, would have produced a swell to fairly test Graeme's claims. Typically, the big winds and swell never arrived, and the test was conducted with a strong offshore breeze. The hooks were baited and the Torpedo fired up, making easy work of the half-metre swell flopping onto the beach. Going through the waves the Torpedo barely flinched, and took a short time to reach the 800 metre mark it had been set for. While waiting for the one hour "soak time", Graeme explained the development process that had taken place, and said he had tried various designs, battery systems, motors and propellers in a test tank at his workshop. A gearbox specialist by trade, Graeme had the technical knowledge to work through the various problems confronting such a device. 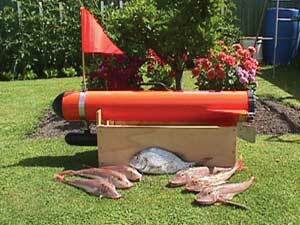 Nothing has been left to chance, and the Fishing Torpedo comes with a 12 month warranty on the motor and batteries. When it came time to retrieve the Torpedo, all was going well until the hook section became snagged on what we thought was the bottom, making heavy going of the job. However, it turned out we had hooked another kontiki that had been lost a few days earlier when someone had taken advantage of the strong offshore breeze to run out a line attached to a large plastic bag filled with air. It seemed that the bag had deflated, sunk to the bottom and been broken off. After a few hassles the line was eventually freed, and one snapper was the only reward for our efforts. However, this was a trial of the machine rather than the fishing spot, and for my money it came through with flying colours. This independent tackle test was written by Grant Dixon Editor of "New Zealand Fishing News"
Paul's Fishing Kites no longer stocks Challenger Torpedos. Contact the Manufacturer for more info on these products.